A father-of-seven who recycles his tea bags up to five times has been named Britain's "tightest" man in a TV show. 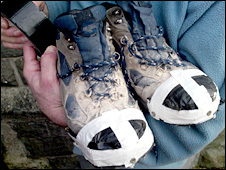 Self-employed builder Ieuan Butler, 42, from Crymych, Pembrokeshire, has worn the same work boots for seven years and his trainers since 1987. But he has only £18,000 left on his mortgage and has put one child through university and two through college. He said: "A lot of people can learn from me the way the current climate is. Money's hard to come by." Mr Butler came out the clear winner in a nationwide search by a Channel Four programme to be broadcast on Friday. He "never ever, ever, goes to the pub" and does not visit the cinema, instead preferring to wait until DVDs are reduced to £2. His work boots have been held together with left-over duct tape for the past three years and his tea bags at work see the inside of his flask five times before they hit the bin. He has the same clothes which he bought 10 years ago, his work jumper has lost all its fleece and he says if he spends £80 a year on clothes he has "overspent". However, he only uses his home tea bags three times and admits to spending £45 per week on food because as an amateur body builder he needs plenty of fresh fruit, chicken and tuna. Mr Butler is due to marry his partner Ruth in a ceremony which he thinks can be done for £500 (the average cost of a wedding in the UK is now £18,500) because it will be on a beach and guests will be asked to "bring a bottle". In all he has four children by his first marriage, two step children and a four-year-old daughter, Rosie, with Ruth. He puts his husbanding of the pennies down to being married at 19. He said: "I had responsibility very very young so from 20 years old until now I have been virtually the same as what I am now." And he is delighted with his new title and reckons people can learn from his example. He said: "I absolutely love it. You've got the minimum wage and the cost of living, the cost of property and houses, so it's hard to bring in a decent wage." "It's not that I don't like spending money. If I have got to spend it on something and I know I need it, I will spend it. "But if something I've got has a few more years left in it, then I won't spend it." "I don't like spending money on anything. If I want something I have got to sit down and think do I really need it?" He did splash out on a new HD TV recently after the TV he had for 14 years broke, but he paid £540 in cash. He had saved the money from loose change he puts in bottles. He also paid for his pushbike (to save money on petrol) with 20p and 50p coins he saved up over the years. He usually goes to the bank to change the coins into notes but he added: "Sometimes if I want to annoy someone I will take them in the loose coins." His wedding will be for just 40 close family and friends, with a small buffet a few drinks, plus any bottles they bring. He said: "People come to the wedding for the bride and groom and their happy day. It's not all about the food and alcohol." The Hunt For Britain's Tightest Person is on Channel Four at 1935 GMT on Friday, 9 January.